From the moment you wake up, whether you realize it or not, you start making decisions. Turn the alarm off. Turn the lights on. Look outside to see what the weather is like. Brush your teeth. Put on your robe and wizard hat. Basically...you get the point. By the time you step outside your door, you consciously or subconsciously will have made hundreds of decisions with each decision having a certain effect on what you ended up doing. If the weather is cold, you do whatever falls into the true bucket. If the weather is not cold, then you do whatever is in the false bucket. Every decision you make can be modeled as a series of true and false statements. This may sound a bit chilly (ha! ), but that's generally how we, others, and pretty much all living things go about making choices. This generalization especially applies to everything your computer does. This may not be evident from the code we've written so far, but we are going to fix that. 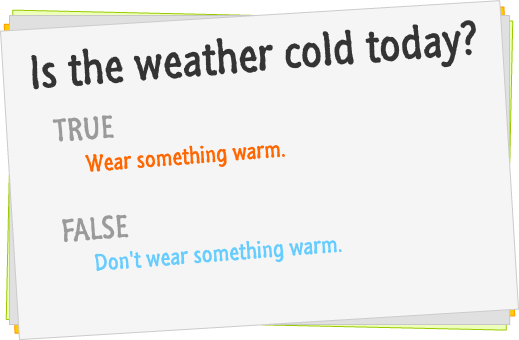 In this tutorial, I will cover what is broadly known as conditional statements. These are the digital equivalents of the decisions we make where your code does something different depending on whether something is true or false. If you put all of this code into a HTML document and run it, you will see an alert with the text You shall pass!. This is because your expression (the thing following the word if that ultimately evaluates to true or false) is the variable safeToProceed. This variable is initialized to true, so the "true" part of your if statement kicks in. This time when you run this code, you will see an alert with the text You shall not pass! because your expression evaluates to false. So far, all of this should seem pretty simple. The reason for that is because we haven't turned up the complexity knob to focus on more realistic scenarios...starting with another look at conditions! In most cases, your expression will rarely be a simple variable that is set to true or false like it is in our earlier example. Your expression will involve what are known as conditional operators that help you to compare between two or more things to establish a true or false outcome. The conditional operator defines a relationship between the expressions. The end goal is to return a true or a false so that our if statement knows which block of code to execute. This may not make much sense yet, but bear with me. Let's look at the conditional operators first before diving into some more examples where everything will become more clear. == If the first expression evaluates to something that is equal to the second expression. When we call this function with a speed of 53, the speed >= speedLimit expression evaluates to a false. The reason is that 53 is not greater than or equal to the stored value of speedLimit which is 55. This will result in an alert showing the "you are not speeding" message. The opposite happens when you call amISpeeding with a speed of 72. In this case, you are speeding and the condition evaluates to a true. An alert telling you that you are speeding will also appear. The thing you need to know about these expressions is that they can be as simple or as complex as you can make them. They can be made up of variables, function calls, or raw values. They can even be made up of combinations of variables, function calls, or raw values all separated using any of the operators you saw earlier. The only thing that you need to ensure is that your expresion ultimately evaluates to a true or a false. There are three comparisons being made here. The first one is whether x is less than xPos. The second one is whether y is less than yPos. The third comparison is seeing if the first statement and the second statement both evaluate to true to allow the && operator to return a true as well. You can chain together many series of conditional statements together depending on what you are doing. The tricky thing, besides learning what all the operators do, is to ensure that each condition and sub-condition is properly insulated using parentheses. All of what I am describing here and in the previous section falls under the umbrella of Boolean Logic. If you are not familiar with this topic, I recommend you glance through the excellent quirksmode article on this exact topic. We are almost done with the if statement. The last thing we are going to is look at some of its relatives. 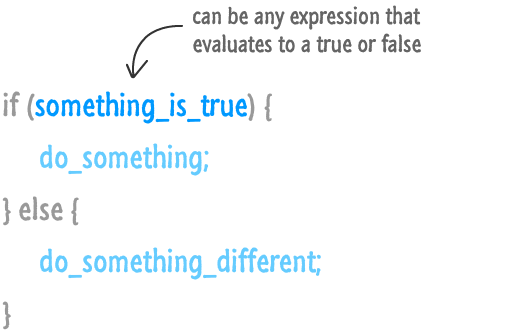 If none of the statements have expressions that evaluate to true, the code inside the else block (if it exists) executes. Between the more complex expressions and if / else if statements, you can represent pretty much any decision that your code might need to evaluate. In a world filled with beautiful if, else, and else if statements, the need for yet another way of dealing with conditionals may seem unnecessary. People with longer beards than you and me disagreed, so we have what are known as switch statements. In this short tutorial, I will describe how to use switch statements and why, putting my initial snarkastic comments aside, they can provide some value. Note that only the code inside the green case block gets executed. That is thanks to the break keyword that ends that block. When your code hits the break, it exits the entire switch block and continues executing the code that lies below it. If you did not specify the break keyword, you will still execute the code inside the green case block. The difference is that you will then move to the next case block (the black one in our example) and execute any code that is there. Unless you hit another break keyword, your code will just move through every single case block until it reaches the end. Note that the default block looks a bit different than your other case statements. More specifically, it actually doesn't contain the word case. At the beginning, I mentioned that a switch statement is used for evaluating conditions - just like an if / else statement. Given that this is a major accusation, let's explore this in further detail by first looking at how an if statement would look if it were to be literally translated into a switch statement. Notice that our expression is number > 10. The case value for the case blocks is set to true or false. Because number > 10 evaluates to true, the code inside the true case block gets executed. While your expression in this case wasn't as simple as reading a color value stored in a variable like in the previous section, our view of how switch statements work still hasn't changed. Your expressions can be as complex as you would like. If they evaluate to something that can be matched inside a case value, then everything is golden...like a fleece! As you can see, if / else statements are very similar to switch statements and vice versa. The default case block becomes an else block. The relationship between the expression and the case value in a switch statement is combined into if / else conditions in an if / else statement. In the previous section, you saw how interchangeable switch statements and if / else statements are. When you have two ways of doing something very similar, it is only natural to want to know when it is appropriate to use one over the other. In a nutshell, use whichever one you prefer. There are many arguments on the web about when to use switch vs an if / else, and the one thing is that they are all inconclusive. My personal preference is to go with whatever is more readable. If you look at the comparisons earlier between switch and if / else statements, you'll notice that if you have a lot of conditions, your switch statement tends to look a bit cleaner. It is certainly less verbose and a bit more readable. What your cutoff mark is for deciding when to switch (ha!) between using a switch statement and an if / else statement is entirely up to you. I tend to draw the line at around four or five conditions. Second, a switch statement works best when you are evaluating an expression and matching the result to a value. If you are doing something more complex involving weird conditions, value checking, etc., you probably want to use something different. That could involve something even more different than a if / else statement, by the way! To reiterate, use whatever you like. For every person who agrees with what I've written, you'll find someone who convincingly can provide a counter argument. If you are part of a team with coding guidelines, then follow them. Whatever you do, just be consistent. 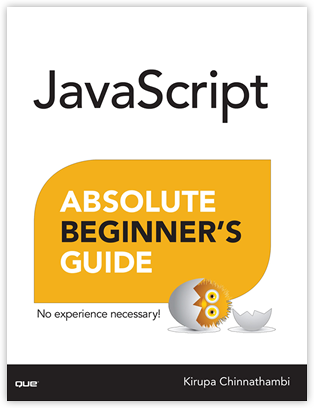 It makes your life as well as the life of anybody else who will be working in your code a little bit easier. For what it is worth, I've personally never been in a situation where I had to use a switch statement. Your mileage may vary.